I am totally in love with Karen Murrell lipsticks. They have girly packaging and great formula. They do not contain any harmful chemicals and have wide range of fabulous and chic colors. I had already reviewed Karen Murrell Lipstick in Camellia Morning and I am using it almost every day. 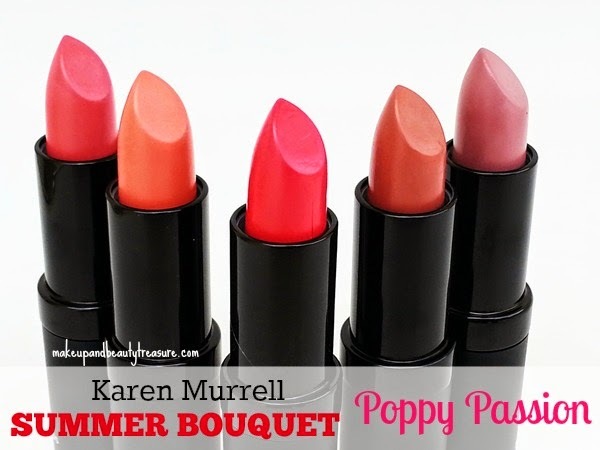 Today I am going to review yet another shade Poppy Passion from Karen Murrell Summer Bouquet Lipstick range. 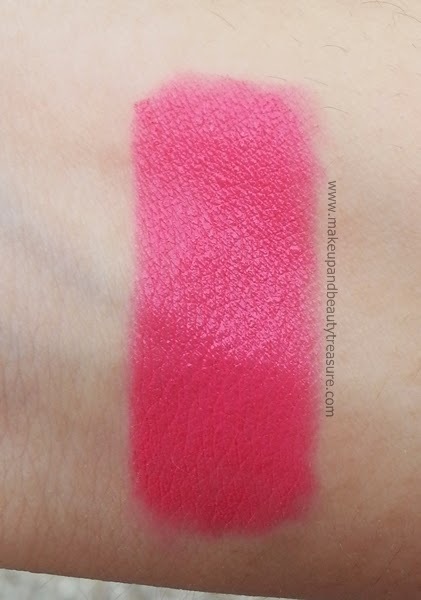 I had already reviewed Karen Murrell Lipstick in Camellia Morning in detail HERE. Please refer that post to know more about packaging and formula. Check out other shades here: Orchid Bloom, Peony Petal and Lavender Laughter. Poppy Passion is bright yet wearable poppy pink color with a lovely creamy finish. 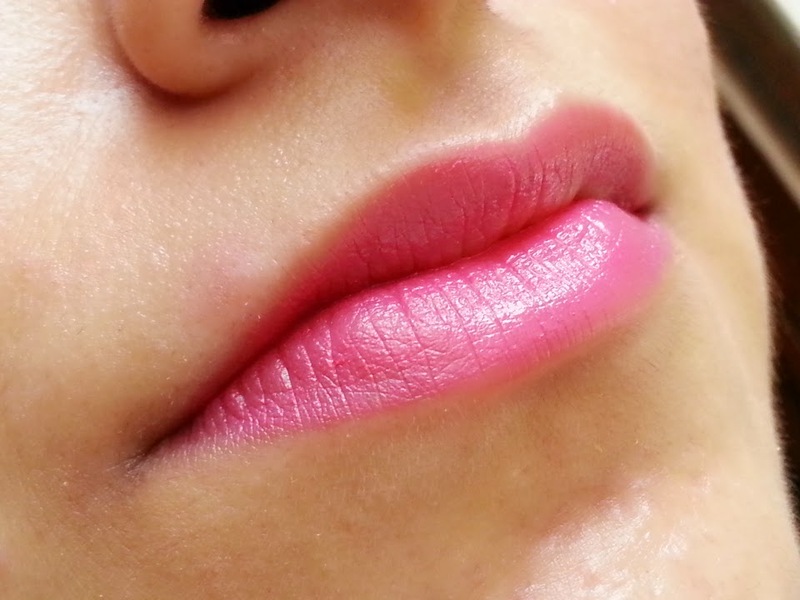 As I am not fond of bright shades, I love applying it with a lip brush. It has a lovely creamy, smooth finish. It does not contain any shimmers or glitters. It instantly brightens up my face. God I am totally in love with this shade. This is the only bright pink lipstick that I can carry comfortably. It would suit all skin tones to the core. It has superb pigmentation and gives true and vibrant color in just a single swipe. It stays put on my lips for a good 6-7 hours with light and heavy meals. It fades evenly but leaves a beautiful tint behind. I applied it lightly. In person it looks darker than the the pic! • Poppy Passion is the beautiful bright poppy pink which is totally a hit for me. It instantly brightens up my face. 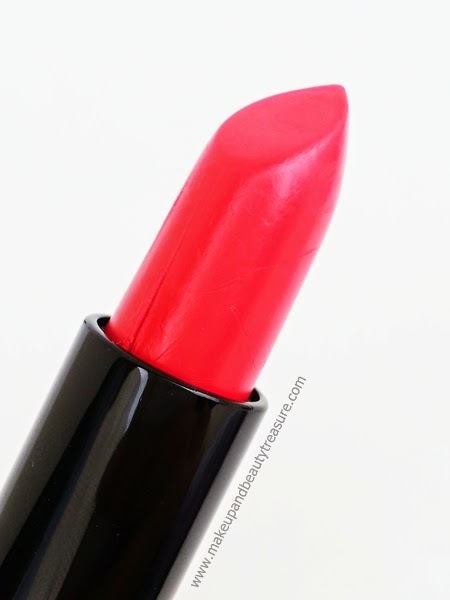 Overall I am totally in love with Karen Murrell Lipstick in Poppy Passion. It is the best bright pink color I have ever encountered. It can never go wrong and instantly brightens up the face. It has superb pigmentation and staying power. Above all it is natural. I would HIGHLY recommend this shade to everyone! Yeah i know u love pinks :) Thanx sweets! The color is very pretty. looks really beautiful on u hun! Wow the lipsticks have a classy packaging and this shade is so beautiful, totally rocking!! Yeah Aroo everything is good about these lippies! Where did you get these ??? Such a pretty shade and the packaging is chic. :) Nice review Meghu! OOOO the shade Meghu!! GORGEOUS!! Looks so good on you and goes straight into my wishlist. These are such nice shades dear.